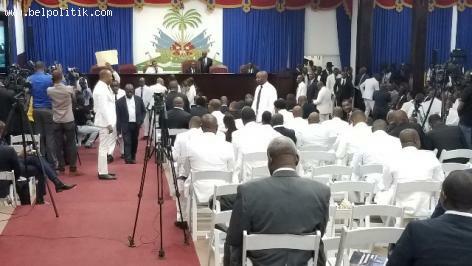 Assemblée National in Haiti - Haitian Senators and Deputes have officially closed the extraordinary Session and oppened officially the first ordinary cession for the year 2019. President Jovenel Moise presented his state of the union address and Prime Minister Jean Henry Ceant gave a pretty long speech to present the realizations of his government. While the prime Minister was speaking on the podium, some opposition deputes decided to make all sorts of noise in order to disrupt the Prime Minister but they only succeeded at gaining the attention of the Media for a short while.